On the 19th and 21st of December our St. Nicholas parish celebrated its Feast Day. 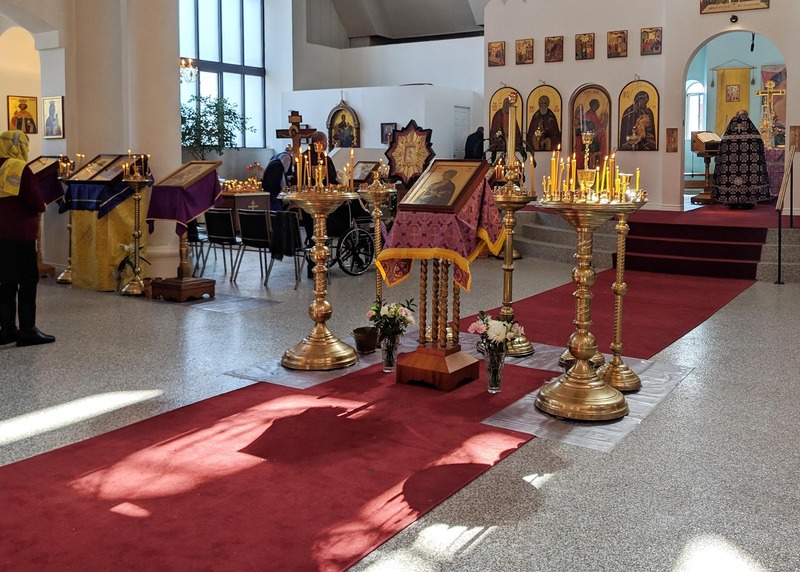 The Divine Liturgy was presided over by the parish rector, Archbishop Gabriel of Montreal and Canada, who was joined by the clergy of the cathedral and visiting Archdeacon Vasiliy Milonow from Ottawa. During the reading of the Hours, His Grace elevated Anatoly Crepostnoi to the rank of sub-deacon. At the end of the Liturgy, Many Years were proclaimed to His Holiness Kyrill, Patriarch of Moscow and All Russia, to the First Hierarch of the Russian Orthodox Church Outside of Russia, Metropolitan Hilarion, to His Eminence Archbishop Gabriel of Montreal and Canada, to the cathedral clergy, to the parishioners, and to all those who were celebrating their Name Day. Completing the celebration of the patronal feast was a festive meal in the parish hall. During the meal Mr. Peter Paganuzzi, a long standing and active parishioner, gave a presentation marking the fifty years since the purchase of the present building. He recounted some happy as well as tragic events from the history of the parish (including the devastating fire), and gave an account of the restoration of the building. The guests were treated to musical performances by the children of parishioners and students of our parish school, congratulating everyone on this festive day. ATTENTION ! Vérifiez la cartes pour les rues fermées- check map for closed streets ! Please Note: June 1st Tour de L’Ile. Many of the roads leading to the church will be blocked from 8:00am in the morning until the afternoon. You should check the Tour de L’Ile website for more details. General Clean Up of The Church, April 14th, 2019!